Explain how to secure a network perimeter. 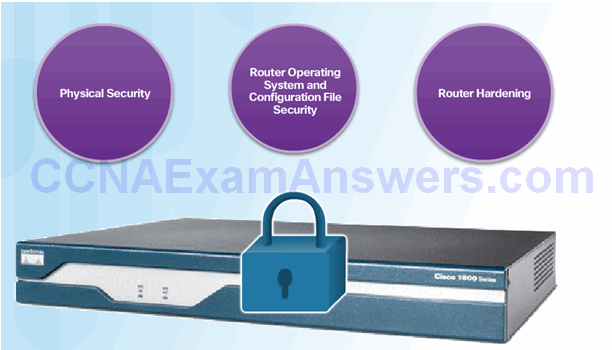 Configure secure administrative access to Cisco routers. Configure enhanced security for virtual logins. Configure an SSH daemon for secure remote management. Use a password length of 10 or more characters. Include a mix of uppercase and lowercase letters, numbers, symbols, and spaces. Avoid passwords based on easily identifiable pieces of information. Deliberately misspell a password (Smith = Smyth = 5mYth). Do not write passwords down and leave them in obvious places. Enable SSH and use a Cisco router as an SSH server or SSH client. Use an SSH client running on a host, such as PuTTY, OpenSSH, or TeraTerm. Configure administrative privilege levels to control command availability. Configure role-based CLI access to control command availability. Level 0: Predefined for user-level access privileges. Level 1: Default level for login with the router prompt. Level 2-14: May be customized for user-level privileges. Level 15: Reserved for the enable mode privileges. Use the Cisco IOS resilient configuration feature to secure the Cisco IOS image and configuration files. Compare in-band and out-of band management access. Configure syslog to log system events. Configure NTP to enable accurate timestamping between all devices. Record the configuration register setting. Change the default configuration register with the confreg 0x2142 command. Press Ctrl-C to skip the initial setup procedure. Put the router into privileged EXEC mode. Copy the startup configuration to the running configuration. Change the enable secret password. Change the config-register with the config-register configuration_register_setting. Transmissions from manager to agent may be authenticated to guarantee the identity of the sender and the integrity and timeliness of a message. SNMPv3 messages may be encrypted to ensure privacy. Agent may enforce access control to restrict each principal to certain actions on specific portions of data. There is a detailed list of security settings for protocols and services provided in Figure 2 of this page in the course. Disable and restrict commonly configured management services. Disable probes and scans. Ensure terminal access security. Redirect traffic to create routing loops. Redirect traffic so it can be monitored on an insecure link. Redirect traffic to discard it. Configure command authorization using privilege levels and role-based CLI. Implement the secure management and monitoring of network devices. Use automated features to enable security on IOS-based routers.